At July 18 press conference, members of Wild Boars soccer team hold up portrait of Navy Seal who died during rescue operation. In early July, the world’s attention was riveted on the Thai Cave Boys, the youth soccer team trapped in the Tham Luang cave in northern Thailand. After an ordeal that lasted nearly three weeks, the last of the 12 boys and their assistant coach all were brought to safety on July 10. In the treacherous three-day international rescue operation, one Thai Navy Seal, Petty Officer Saman Kunan, lost his life. 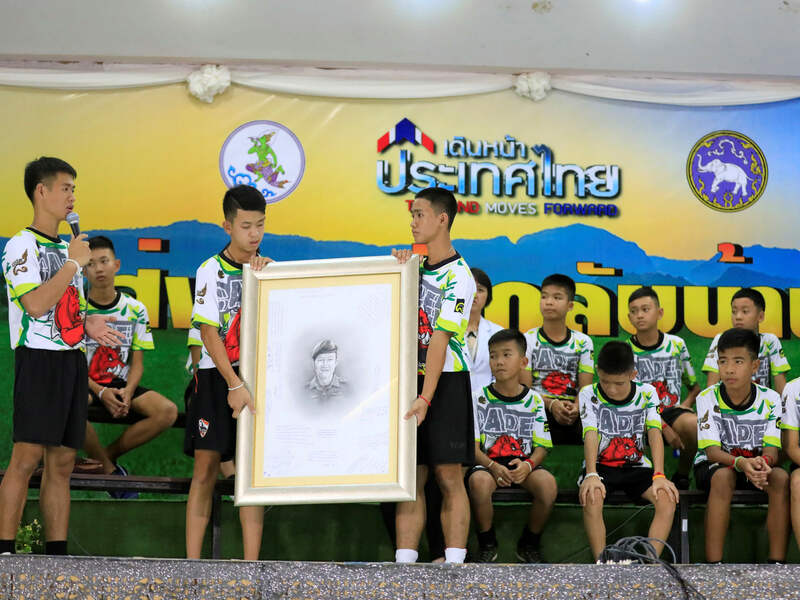 On June 23, the boys, ages 11 to 16, along with their 25-year-old coach, were exploring the cave near the town of Chiang Rai when heavy rains flooded the narrow passageways they had climbed through. Their only hope was to push deeper into the cave to escape the rushing waters. Eventually, they perched on a ledge above the water’s surface, in pitch-black isolation—more than 2,500 feet underground, and about 2.5 miles from the cave’s entrance. For nine days, no one in the outside world even knew they were alive. The team, known as Moo Pa (Wild Boars), had left their bicycles and possessions outside the cave. Once they were discovered missing, a frantic search began. Efforts began immediately to pump water out of the cave—eventually removing over 400,000 gallons per hour, and unfortunately flooding farmers’ fields downhill. Night and day, divers braved the narrow, flooded passageways—but to no avail. It was not until July 2 that expert British divers emerged in the cavern where the team was trapped. After they were found, a complex international rescue mission involving hundreds of people ensued. The head of FIFA, the sponsoring body of the World Cup, extended invitations to the young footballers to attend the final in Moscow on July 15, but Thai authorities said they were not fit enough to travel and had to remain in the hospital. On July 18 the boys and their coach were finally released and held a joyous press conference in Chiang Rai. Everything you need to know about the cave rescue of the century: articles, videos, photos, timeline, infographics. Coverage of the conclusion of the dramatic rescue operation; includes videos and updates. Coverage of the press conference of the Thai Cave Boys upon their release from hospital. A photo gallery of the rescue operation at Tham Luang cave in Thailand.